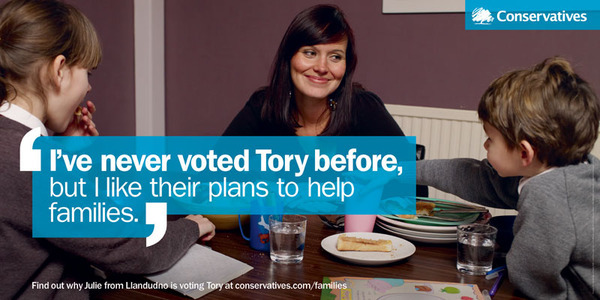 The Conservative Party have released 3 new posters, carrying the headline ‘I’ve Never Voted Tory before’. The aim for this set of adverts is clear (indeed they’ve essentially written the brief as the headline): to get people who’ve never voted Conservative to reconsider their previous preference. These executions are so inoffensive, vanilla and generic that it’s almost as if they’ve come straight out of a ‘previous Labour voter, now considering Tory’ research group and made the three most re-occuring themes into posters. That’s not how to use research. It should be a platform for a creative leap, not a dictat as to what you should put as your next headline. In 1997 millions of people voted for New Labour who, even 2 years prior, would have not considered it even in their wildest dreams. The Conservatives are trying to replicate that broad coalition of support. However, you don’t build broad support just through poster campaigns and I wonder if enough people are clear about what the Conservatives would do to address the various policy areas they reference. Yes, they drive people online for more information, but big poster campaigns are primarily a broadcast medium – why not use it to shout your point of view on a given issue? This is the 3rd poster campaign (RIP Off and We can’t go on like this) in 2 months and each one has been so different in content and tone that it’s almost schizophrenic. Obviously, these poster campaigns are largely used to dictate the news agenda and having a consistency of tone, look and message isn’t as important as it is for a non-political brand. But by being so inconsistent in your approach you can begin to look erratic and nervous. Two qualities that do not communicate ‘government-in-waiting’.